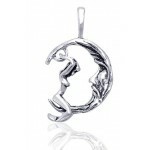 A movable Goddess sits astride the Man in the Moon in this unique and fun sterling silver pendant. 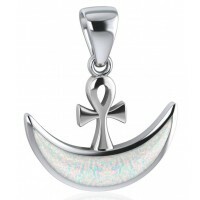 Pendant measures .86 inches high with attached bail (chain not included). Item Number: PS-MG322 | Approximate Size (Inches): 0.75 wide x 0.05 deep x 0.86 high | Approximate Shipping Weight: 0.25 lbs.